After ten years of production, MINI proudly completed assembly of their two millionth MINI from the production line at their Oxford plant. 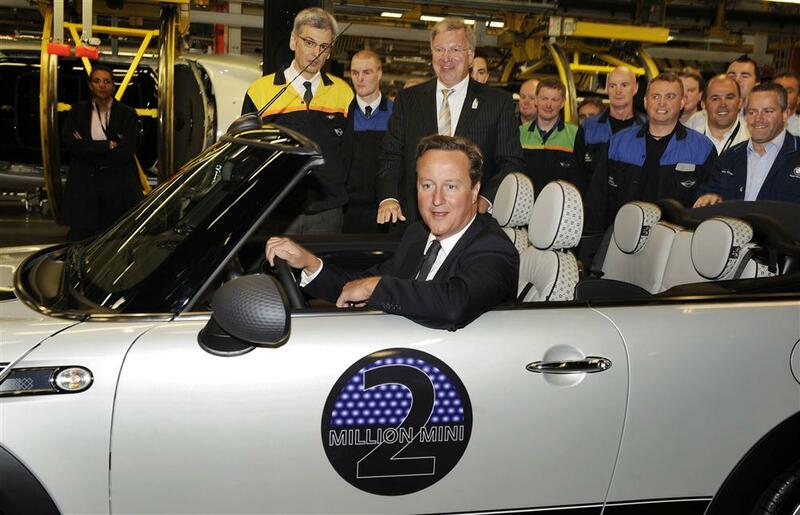 British Prime Minister David Cameron, pictured below, was the honorary driver for the two millionth MINI. The two millionth MINI was a convertible with special paintwork and additions to celebrate the milestone. MINI has come quite a long way since production began. In 2010, MINI was the third-largest manufacturer in Britain and saw 216,302 vehicles roll off its production line and sent to 90 different countries, quite a global reach. The advancement of the MINI production process is astounding. When production was going on in 2001, there were 2,400 employees for a single shift that would churn out 300 cars a day. Today, 3,700 workers are employed at the plant for two shifts, five days a week and can build 900 cars each day. The plant itself has gained with the ability to produce over 200,000 units annually compared to 100,000 in the beginning. The plant is expected to achieve 260,000 units annually. In anticipation of the milestone, MINI has been running a “2 Million MINI – 2 Million Faces” campaign on their Facebook page. Contestants submit their face to MINI’s wall and MINI will compile all two million faces on a special wall. The randomly chosen winner from the faces will walk away the winner of the special-anniversary MINI. The contest ends September 30. Get your face on MINI’s wall so you can get your chance to take this beauty home! Attention MINI drivers! Mark your calendars for September 3 at 4pm for the MINI rally and picnic plus a surprise ending you can’t miss! 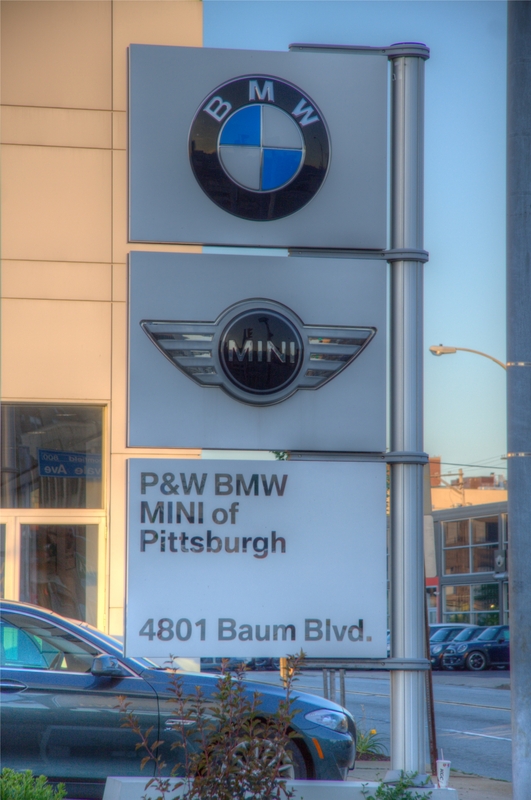 The rally will begin at the MINI of Pittsburgh dealership. When consumers buy a MINI, they become a part of a fellowship of drivers. MINI drivers love to meet up for events and motor around the city together to show off their passion for MINI. The uniqueness of a MINI makes them special and drivers love to meet other drivers that share the same car love. The rally and picnic event on September 3 gives MINI drivers a chance to come out and meet their fellow MINI owners. The group will drive in style throughout Pittsburgh showing off the prestige of a MINI and enjoying a picnic together. Drivers will take off from MINI of Pittsburgh after receiving a set of directions for the rally. The rally will take drivers to five checkpoints in Pittsburgh along the way to the secret location of the picnic. At each stop of the rally, drivers will pick a card from a deck. Owners will then formulate their best poker hand at the end. The winner with the best poker hand will receive a small prize. The event is put on by the Motoring the ‘Burg and Pitt Stop MINI Club. Registration for the event is $5 and can be done online at www.pittstopmini.org. The groups also have membership as well. Make sure to get registered for this event fast because you don’t want to miss this! Come meet fellow MINI drivers, try to win some prizes, have some food and drinks and check out the awesome surprise ending! Holy MINI of Gotham City Batman!!! Batman was being filmed in Pittsburgh so we got to brainstorming, what could we do to get in the spirit? We wanted to truly represent our “role” of being a business in Gotham City. That’s when the brilliant idea of changing the sign out front to MINI of Gotham City came out! What a great idea! Sure the movie filming caused plenty of road closures and headaches for anyone trying to get around, but we are talking about BATMAN! And how cool is it that it is being filmed in the greatest city ever, Pittsburgh? Since changing the name, we’ve had such a great time. People stopping in the middle of the street to take pictures of the sign, past customers bringing their MINI back to take a picture with the sign, and so many positive comments about it made the name change so enjoyable. We couldn’t be happier with Batman choosing to come to Pittsburgh to film the third movie. We’re glad everyone had as much fun with the name change as we did. 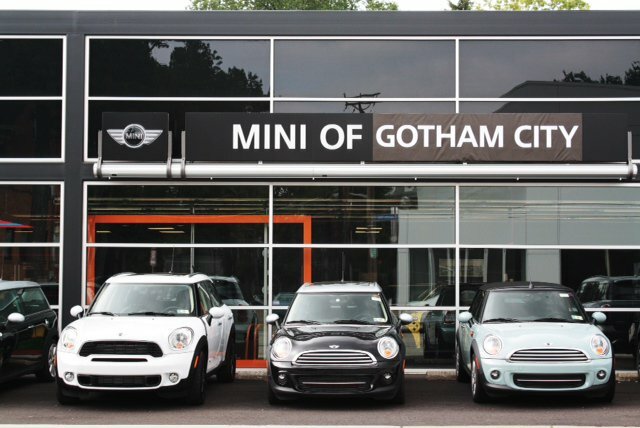 We might even keep the name MINI of Gotham City, it does have a certain ring to it………. Excited for the MINI Coupe? Well now you can pre-order your MINI Coupe and get yours reserved ahead of time at MINI of Pittsburgh. The all-new MINI Coupe is a two-seater from MINI that possesses great fuel efficiency and plenty of speed and handling for a driver and one passenger to enjoy the open road in. The highly anticipated MINI Coupe is expected to arrive at dealers in October. The Coupe is a great vehicle for drivers looking for the extreme go-kart handling that MINI is known for. The MINI Coupe also is extremely fuel efficient, pulling in 37 mpg on the highway and 29 mpg in the city. With the fuel efficiency of the Coupe, drivers can go 488 miles per tank (13.2 gallon capacity), or from Pittsburgh past Chicago for example. 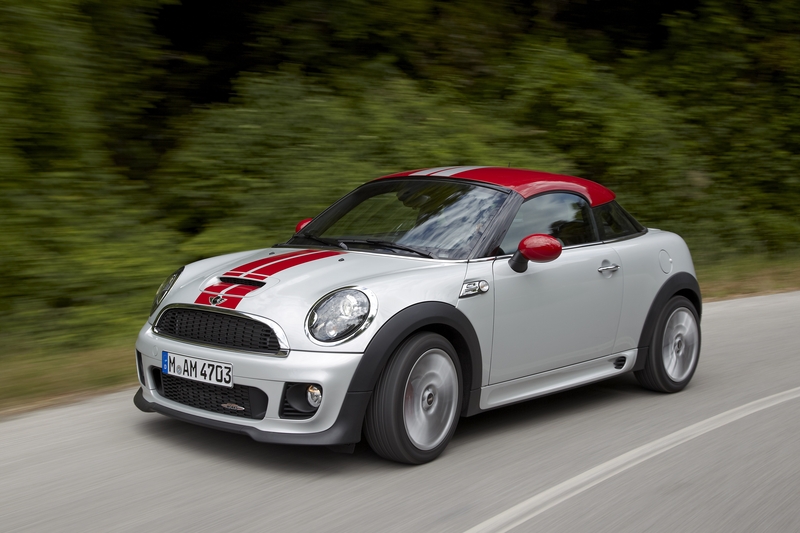 The MINI Coupe has three versions, the Cooper Coupe, Cooper S Coupe, and the John Cooper Work Coupe. The Cooper Coupe is powered by a 1.6 liter engine that gains 121 horsepower while the Cooper S is brought to life by a 1.6 liter turbocharged engine to deliver 181 horsepower. The John Cooper Work Coupe has a tuned 1.6 liter turbocharged engine that unleashes 208 horsepower and 192 lb-ft of torque. All versions of the MINI Coupe have a rear spoiler that automatically engages when the car hits 50 mph to optimize air flow for the Coupe’s performance. Safety is embodied in all versions as well to protect the compact MINI. Four total front and side airbags work together to protect drivers in case of a crash. With numerous options available for the MINI Coupe, each MINI Coupe is special and the possibilities are endless. Stop in to MINI of Pittsburgh today to pre-order your MINI Coupe or visit MINI USA and order online. Manualhood? What’s that you ask? Well, MINI explains that Manualhood is the time in every driver’s life where they crave more, the speed, the handing and exhilaration that an automatic car just can’t live up to. MINI wants to help you reach Manualhood with providing $500 off your new MINI when you get a manual transmission and will have a training platform to teach drivers how to drive manual cars. Driving a manual car has a lot of benefits including a lower starting price, better fuel efficiency, technology like Hill Start Assist, and increased performance and control. MINI analyzed their new car purchasers and saw 34% of hardtop, Clubman and Convertible owner and 27% of Countryman owners bought a manual. Plenty of drivers are buying manuals, but so many more could receive the thrill of driving a manual in a MINI so they began their Manualhood campaign. Starting in the middle of August, MINI dealers will be equipped with a Manualhood kit to outfit the training vehicle for manual car instruction. The kit includes floor mats, buttons, boot decals, door magnets, a Manualhood booklet, and a “MINI Manual Driving School” car topper to completely outfit the vehicle. Are you ready for Manualhood?